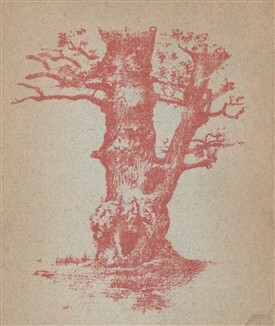 Frontispiece illustration from the above book - perhaps it shows the Millhouse Oak? "Artisan poet of Nottingham & the Burns of Sherwood Forest"
Robert Millhouse was a poet and stocking loom weaver from Nottingham. A collection of his work is contained in a book published in 1881 and compiled by John Potter Briscoe, the Public Librarian of Nottingham. Millhouse is described in the book as ‘The Artizan Poet of Nottingham, and the Burns of Sherwood Forest. 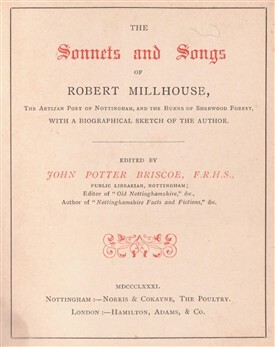 (1) The volume entitled ‘The Sonnets and Songs of Robert Millhouse’ contains fifty five sonnets, including Stoical Apathy, Early Morning and To a debilitated and sickly son; and twelve songs including one of his best known pieces ‘Song of the Patriot’. As his family grew he continued to write but the stress of combining this with work, providing for the family, ill health and poverty led him in 1822 to ask for financial assistance from the Royal Literary Fund. At the same time an appeal was made by a Dr. Booker, on his behalf, in the Gentlemen’s Magazine and copied in the Nottingham Journal. As a result of this and a new benefactor, Mr Thomas Wakefield, he was able to continue writing and in 1823, “Blossoms” was published containing twenty four sonnets. He followed this with “The Song of the Patriot” in 1826 with both sonnets and songs included and “Sherwood Forest and other poems” in 1827 with nine new sonnets. In 1836, on 5 November, he married Marian Muir or Moore at St Stephen’s Church, Sneinton, Nottinghamshire(9) and had two more children, James 1836 and Ann 1838. (10) Robert continued with his walks in the countryside and on one occasion, caught in a thunderstorm, he sought shelter in the hollow of an old oak tree which later became known as the ‘Millhouse oak’. In 1838 he took ill again while living in Walker Street, Sneinton. Literary and other friends helped him with medical treatment and money but he died on Saturday 13 April 1839 and was buried five days later in Nottingham General Cemetery. Some years later friends subscribed and provided a gravestone. An epitaph written by Dr Spencer T. Hall was inscribed on the stone. Baptism, parish records, England, St Mary, Nottingham, Nottinghamshire 1788/11/06. Nottinghamshire Baptisms. www.findmypast.co.uk – accessed 30 Apr 2015. Marriage, parish records, England, St Mary, Nottingham, Nottinghamshire 1785/03/1785. Nottinghamshire Marriages 1528-1929. www.findmypast.co.uk – accessed 30 Apr 2015. Baptisms, parish records, England, St Mary, Nottingham, Nottinghamshire; Millhouse 1786-1805; Nottinghamshire Baptisms; www.findmypast.co.uk – accessed 30 Apr 2015. Marriage, parish records, England, St Mary, Nottingham, Nottinghamshire 1818/08/25; Nottinghamshire Marriages 1528-1929. www.findmypast.co.uk – accessed 30 Apr 2015. Baptisms, parish records, England, St Mary, Nottingham, Nottinghamshire 1820-1832; Nottinghamshire Baptisms, www.findmypast.co.uk – accessed 30 Apr 2015. Baptisms, parish records, England, St Stephen, Sneinton, Nottinghamshire -1836 – 1838. Nottinghamshire Baptisms, www.findmypast.co.uk – accessed 30 Apr 2015. This page was added by Website Administrator on 07/05/2015.